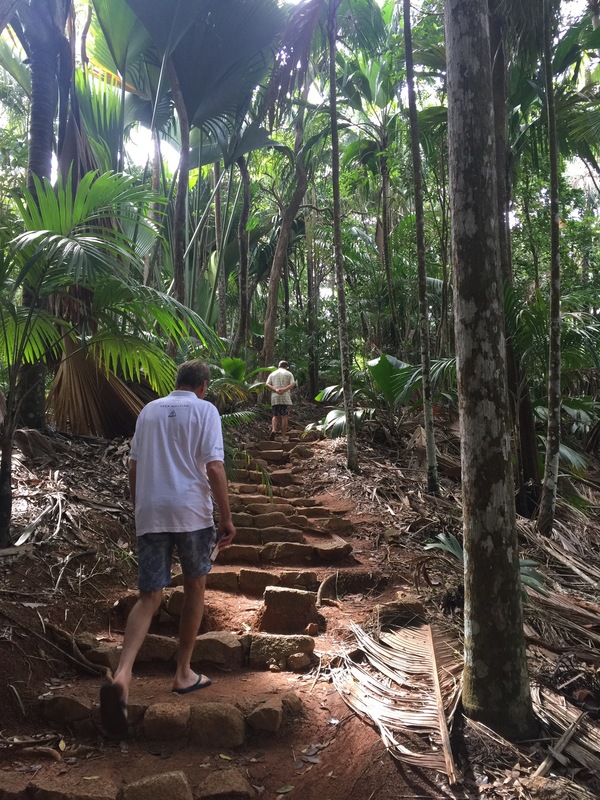 As mentioned in last weeks post, Stuart’s dad Warwick recently spent a week in the Seychelles on his way back from Europe which gave us the perfect excuse to down tools and play tourist. We covered a lot of ground in the week that Warwick was here, island hopping, beach barbecuing, mini-moking and hiking. 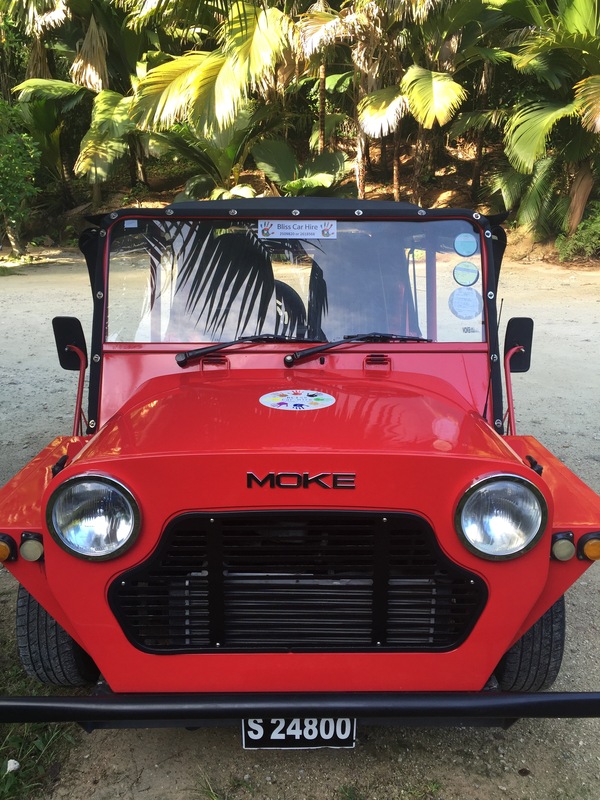 One highlight from Warwick’s week in paradise our day trip to Praslin where we covered all of the island’s tourist hot-spots by way of a bright red mini-moke – 100% the best way to see the island. 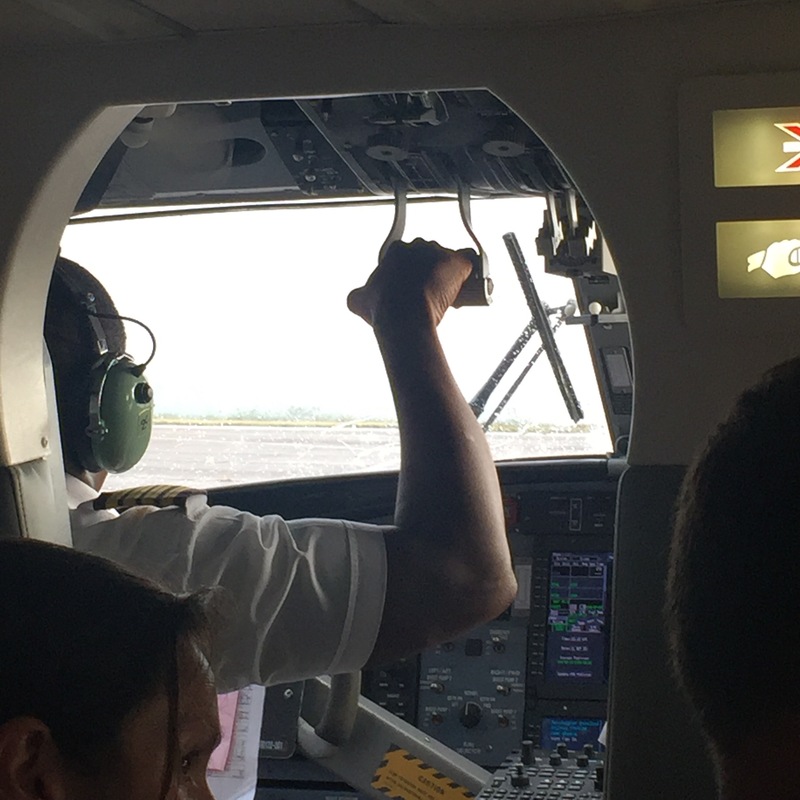 We started our day with a relaxed early morning flight from Mahe to Praslin on one of Air Seychelle’s colourful twin-otters. 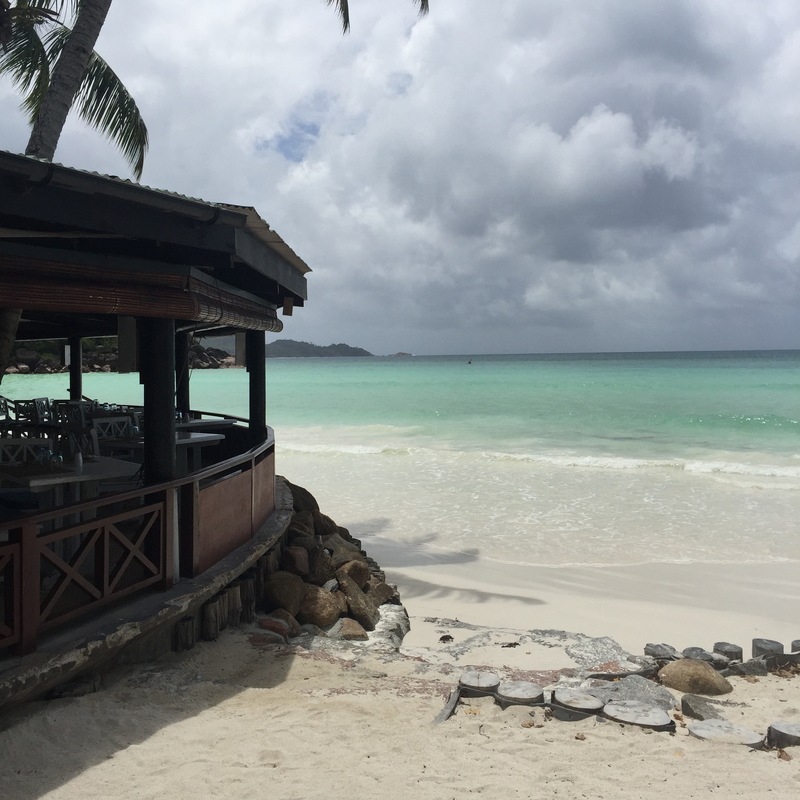 It is a short 15 minute hop across the azure Indian Ocean to Praslin where you can enjoy a wonderful birds eye view of the islands, coral reefs and sailing boats below. 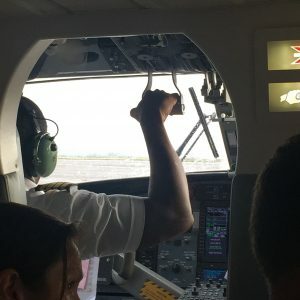 You can even watch the pilots at the controls the entire way which makes for some great pictures if you’re seated in Row 1. 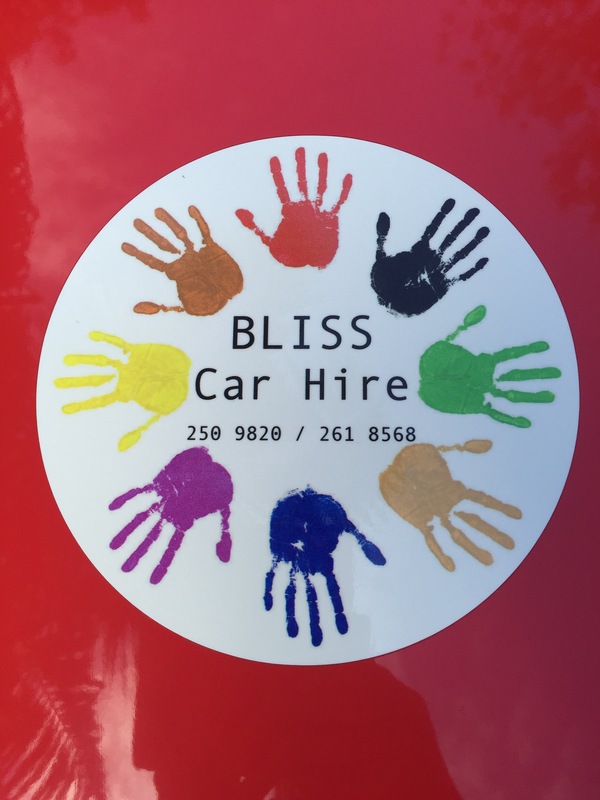 On arrival at Praslin airport we were met by Stephan and Sylvie, the friendly faces of Bliss Car Hire who handed over the keys to a bright, shiny, red mini-moke – the perfect way to explore this little island. From the airport we headed straight to the Vallèe de Mai to trek through this wonderful world heritage site and see the endemic Coco-de-Mer first hand. 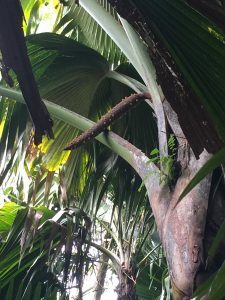 As you may have read in our blog previously, the Seychelles Islands are considered a living museum of natural history and a sanctuary for some of the rarest species of flora & fauna on earth, with almost 50% of the island’s landmass is set aside as national parks and reserves, including two U.N.E.S.C.O World Heritage Sites: the coral atoll of Aldabra, and Praslin’s legendary “Vallée de Mai”. 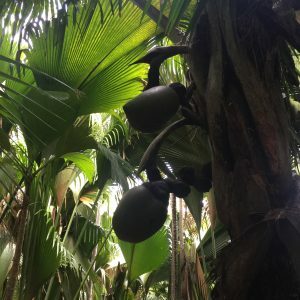 The Vallèe de Mai was once believed to be the original site of the Garden of Eden and the home of the famous ‘Coco De Mer’ palm, of which there are some 6,000 trees are currently nestled within this hauntingly beautiful primeval forest.The Vallée boasts six endemic palm species as well as many other indigenous trees and is also the last habitat of the endangered Black Parrot. You can walk various trails through this lush rainforest, past majestic waterfalls to view these huge trees to see the famed “Coco de Mer” nuts and flowers in their natural habitat. 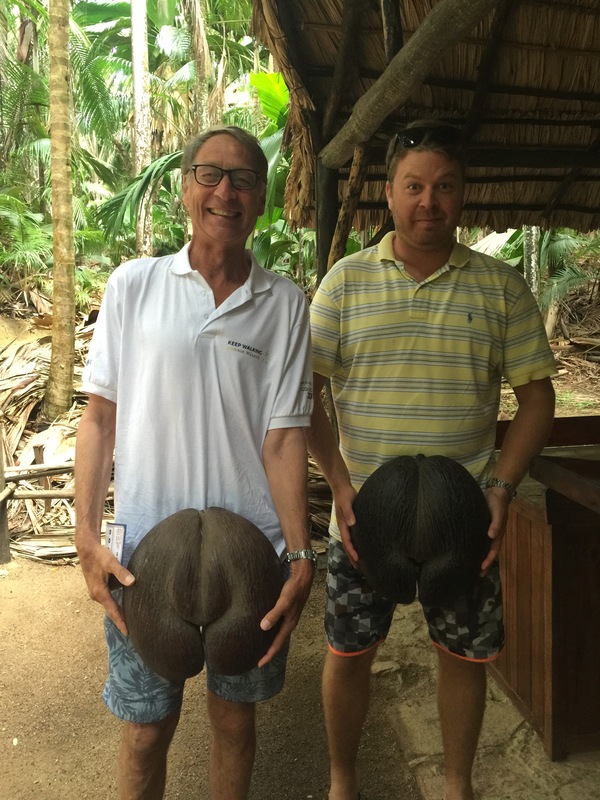 You also get opportunity to touch and feel a coco-de-mer but for yourself and even take a cheeky selfie with the famous love nut if you so desire (as Stuart and his dad did). From the Vallèe de Mai we moked across to Anse Lazio, often listed amongst the world’s top ten beaches. Anse Lazio is a true tropical paradise hidden away at the end of a long windy road and boasting soft white sand, calm aqua blue water and beautiful granite rocks – well worth the journey for anyone visiting Praslin. 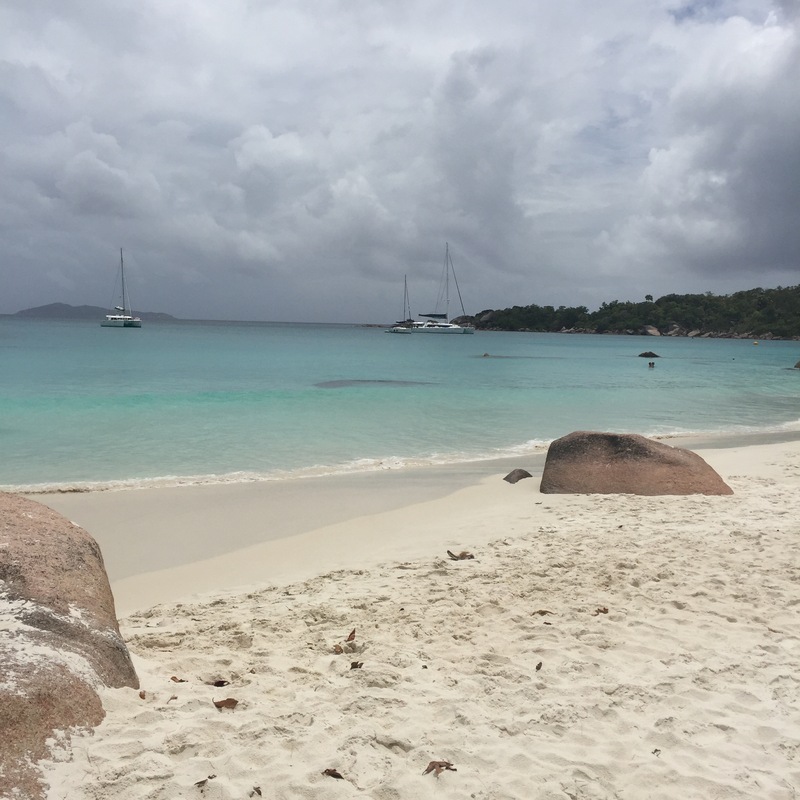 Even on a cloudy day, Anse Lazio is stunning! Ideal for swimming, snorkelling and sunbathing, Anse Lazio has something for everyone and features two restaurants perfectly placed for a tasty lunch. 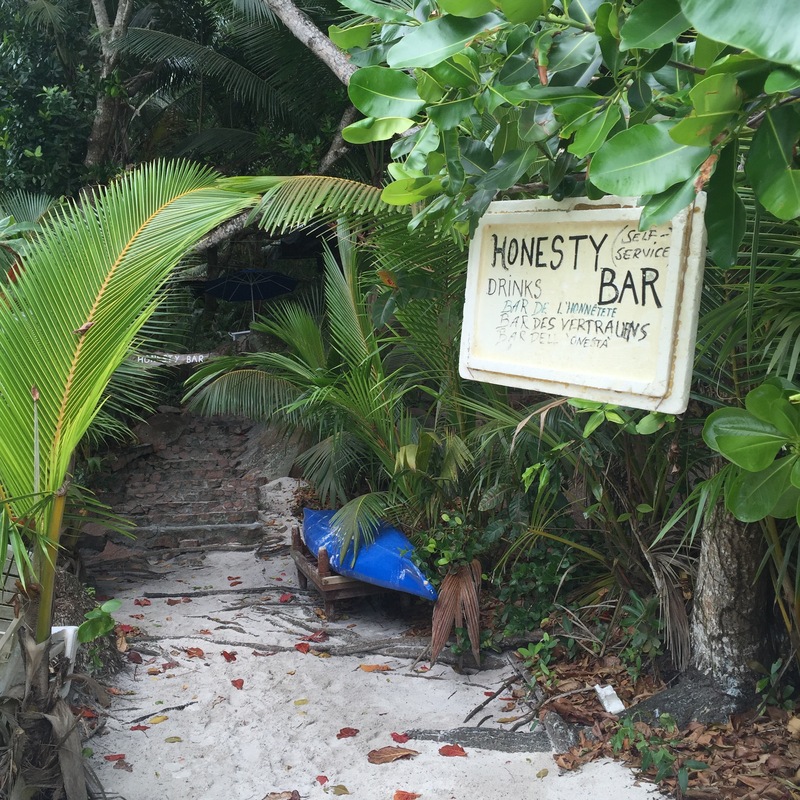 There is even a hidden ‘honesty’ bar located right at the end of the beach offering drinks and snacks to hungry explorers that stumble upon it. We loved it up there, and even caught a glimpse of a pod of dolphins crossing the bay. 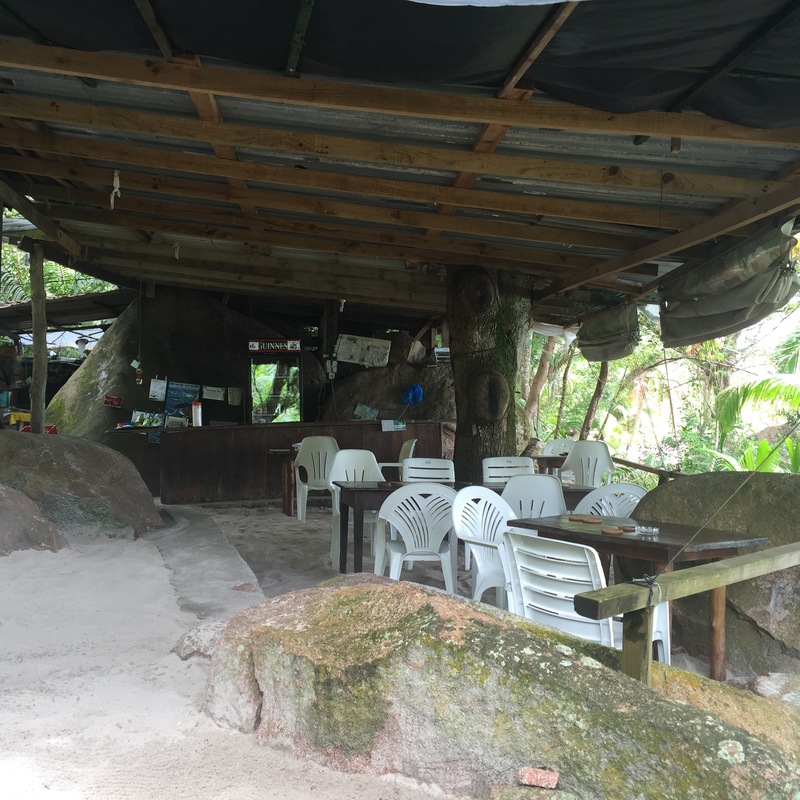 From the beach we headed up to the Zimbabwe Lookout, a narrow winding road not for the faint-hearted but well worth the view when you hit the highest point in Praslin. 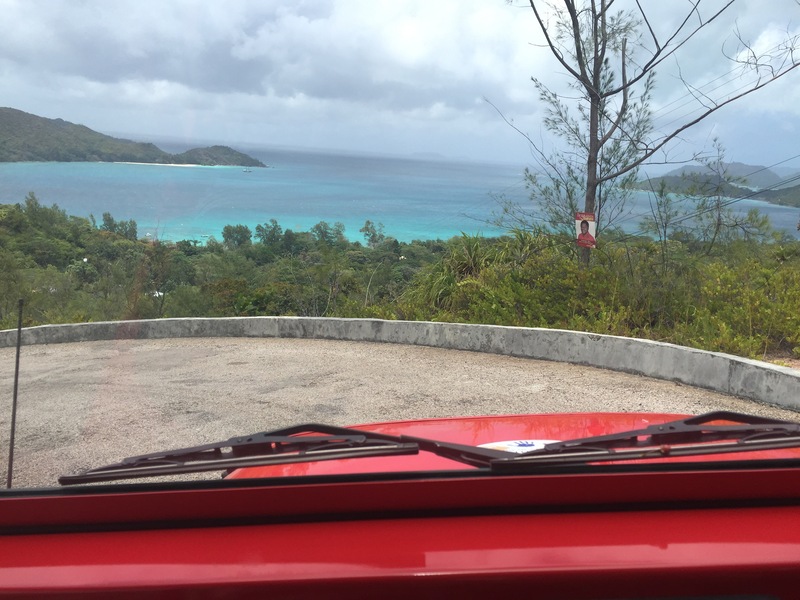 From the top you can see the surrounding islands, aqua blue waters and lush valleys of Praslin. Be warned that the road has seen better days so be prepared for a few large pot holes, and no real turning point at the top so please drive carefully. The climb over and with rumbling tummies we headed to Anse Volbert (Côte D’Or) for a tasty lunch at Paradise Sun’s popular beachfront restaurant. 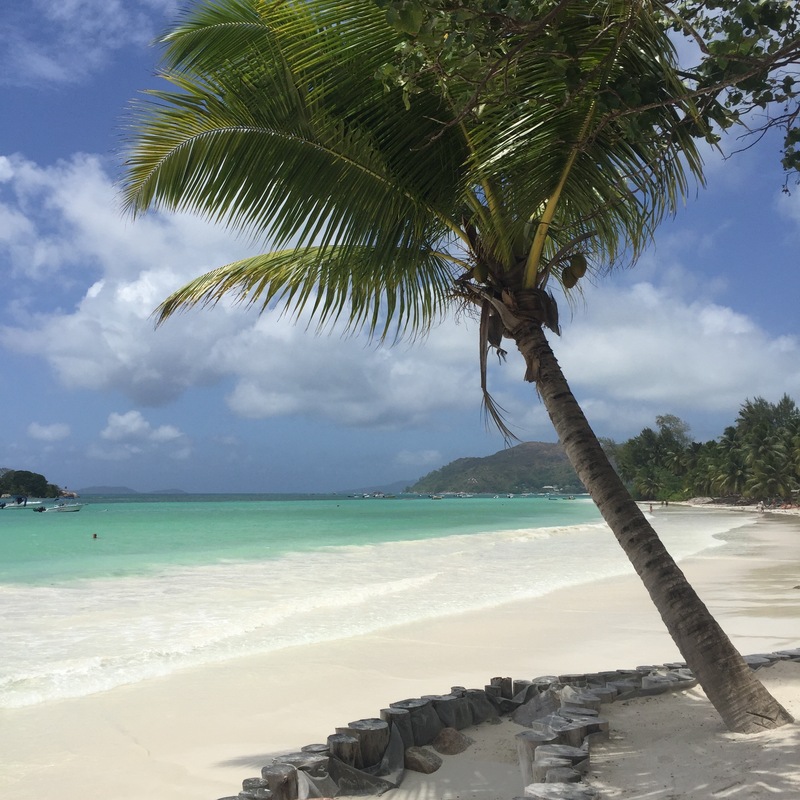 Anse Volbert also known as Côte d’Or, is Praslin’s main beach, a dazzlingly white stretch of beach with crystal clear blue seas – perfect for swimming, water sports or just a relaxing beach walk. There are plenty of restaurants, bars and shops along the strip so it’s a great spot to put down your towel and enjoy a lazy day at the beach.